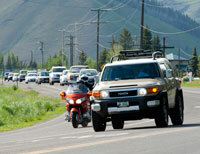 The Idaho Transportation Department is hopeful that a change in traffic lane configuration on state Highway 75 near St. Luke’s Wood River hospital south of Ketchum will help alleviate a continuing problem of traffic delays caused by road construction. The change, shifting traffic from the old roadway to newly constructed southbound lanes, was accomplished Wednesday evening. ITD announced in a press release Wednesday that the contractor, Idaho Sand & Gravel Co., will now focus work on completing the northbound lanes, with work starting primarily on the north end of the project near the hospital. ITD acknowledged that some delays will continue, but expects that they will not be as bad as occurred on May 21, when southbound traffic was backed up to Ketchum and beyond for about an hour and a half. “Following the extensive delays of May 21, the contractor has been complying with the contractual obligation to have flaggers off the roadway and two lanes of travel maintained through the construction zone after 4 p.m.,” the press release states. “Extended traffic delays have continued due to several factors, such as observed by ITD and the contractor, and include heavy traffic and backup beginning before 4 p.m., short signal time for Idaho 75 traffic through the Elkhorn Road signal, and large amounts of traffic entering from Elkhorn Road. The road work is being done as part of an ITD project to widen Highway 75. The first phase, begun last year and expected to continue into this fall, is to widen the 3.25-mile section of highway between Timber Way north of East Fork Road and the bridge over the Big Wood River near St. Luke’s. When completed, the section of highway will have two lanes in both directions and center turning and deceleration lanes at main intersections.